Alarms are a great way to protect your property. As soon as an intruder attempts a break in, you and your neighbours can be alerted instantly. 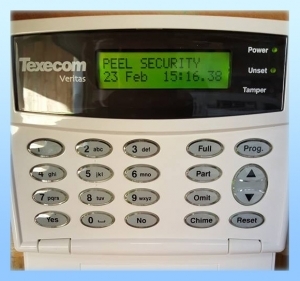 All our alarms we fit are made by Texecom, simply because a system as important the welfare of your family and contents needs the best money can buy. There are essentially two types of alarm systems we can provide; audible at source, or monitor & response. An audible at source alarm sounds at the premises only. Response is reliant on somebody contacting the police to report it. Many forces have a policy whereby they will not attend audible only alarms unless there is additional evidence to suggest a crime is being committed, in other words they are not likely to attend unless someone reports a visual sighting or noises such as glass breaking. How many times is recent times have you heared a house alarm sounding and not even thought about it? What if your neightbours also did this during a break in. The better option is monitor & response alarm systems. With these type of systems, the alarm sounds at the premises and a signal is sent to an alarm receiving centre (“ARC”) via your phone line. The ARC will contact the police* and your nominated key holders. We can supply alarms for small homes and out buildings all the way to large commercial properties. Simply get in touch or fill in an online quote for more information. Now installing the Texecom Connect on all new systems. you can set/unset and once activated it will alert you via the app on your smart phone. 07900970470 for a custom alarm quote. Alternatively, we do have a deal running for a brand new system installed and setup for only £399. *If you require police response please phone for more information as there will be extra costs involved due to the extra protocols and legal requirements that can add to the total cost. Contact switches are made up of two small magnetic strips in plastic houses that fit to your door and windows. then these strips are separated more then 2cm, this breaks a circuit and triggers the alarm. This will generally stop the intruder outright. The key holder will be notified by the monitoring company as soon as your alarm triggers. The monitoring company can alert the police to the situation if required. This fast response to an activation can seriously minimize the loss or damage. When the alarm is triggered, everybody in the area will be notified via the 120db external bell box. This bell box will also emit a flashing strobe to people in the vicinity, so people will know which building is under attack. Setting your alarm is an easy process, and is done right before leaving your premise. We will install a keypad where you would like. Simply push a button to activate the sensors on exit, and enter your keycode on return to disable. Alarms can detect intruders in your home by sensing movement in your property. This works by detecting movement or heat maps in your home. The main brain of the system is in a panel which we can install anywhere in your house. This panel would idealy live in a out of vision place such as a utility room or cupboard. This panel is protected by a mains power, and backup battery which will last for up to 24H if the main power is cut.